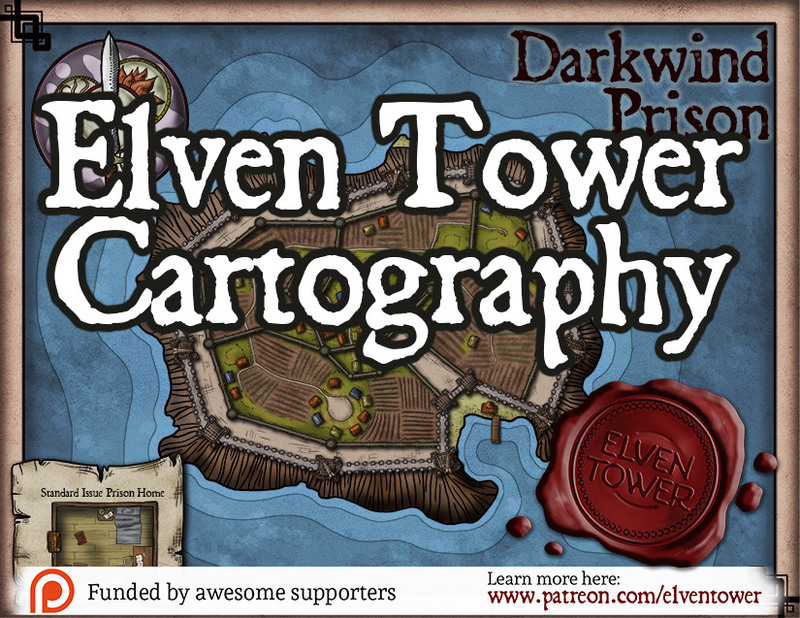 This resource features the general description of a prison island named Darkwind Prison. It includes adventure ideas that are appropriate for low to mid-level (Levels 1 to 10) adventuring parties. There was once a time when prisons held only petty criminals and low-lives of the great cities. While the intention of having dangerous people behind bars was to teach them a lesson and reform them, that was hardly the case. Prisons often are just a temporary buffer zone for bad folks to be while the rest of the townsfolk sleep more peacefully every night, knowing that the worst of the city are caged. Criminals often become recurrent visitors and sometimes permanent visitors to such places. And prisons in the different kingdoms are just the same: a bunch of bare cells, disgruntled guards, and prisoners rotting their lives away. But there was a real predicament when it came to royals and nobles choosing the life of evil. Nobility law demands a different treatment of their members. As it is often stated, nobles and peasants are not the same, even in crime. An incarcerated noble is far more likely to have a decent quality of life than a petty criminal. Noble criminals are often not even jailed at all, since they often are above the law and they are so few in numbers, compared to the general population. Still, there was a greater problem in trying to apply the law to nobles and royals. If a royal member is incarcerated, there is a possibility of his lackeys, paid muscle, and other family members to break them out of their cell. And it has happened many times. The most famous case involved the king’s brother. He was a sadistic killer who had his way with many of the castle’s servants. He was eventually imprisoned after killing another member of the royal family. He was put in the biggest prison in the city, in his own cell, and with added privileges. A week later, a group of armed mercenaries known as “The Crooked Company” stormed the prison in great numbers and extracted the king’s brother from it. They killed scores of guards and other prisoners in the process. The king’s brother did not even hire them for the job. The company took a risk and rescued him with hopes that they would be well paid off. It became clear that there had to be a different kind of prison arrangement for royals and nobles. People so powerful and important, that even behind bars, they pose a great danger to society. It had to be a prison, because nobles were exempt from the death penalty, as stated in the law. This is how Darkwind Prison was born. 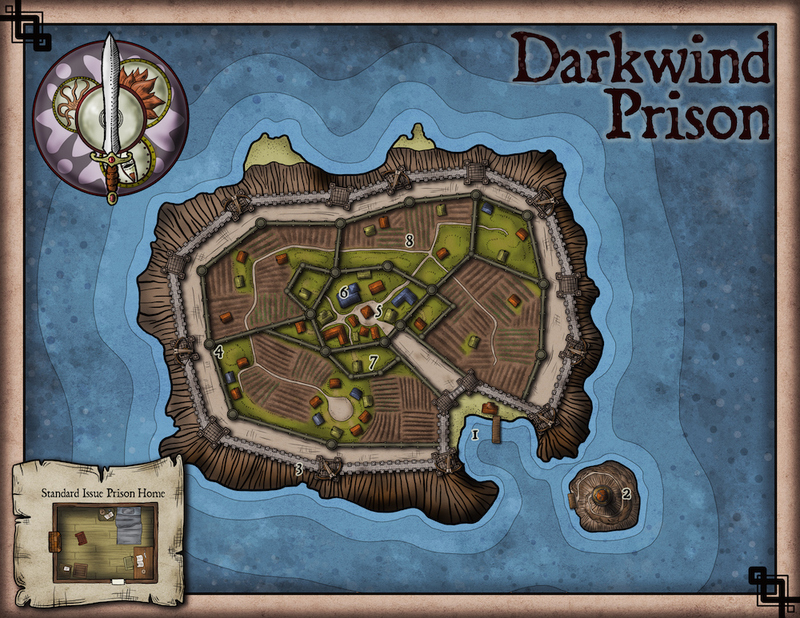 Darkwind Prison is located a few miles from the kingdom’s capital in the high sea. The island had already been developed centuries ago. It used to be a maritime fortress. The sea fortress was stormed during that war and the castle was destroyed down to its foundations, but the external walls remained almost untouched. The wall was restored. A second smaller wall was added in the interior of the island, this smaller wall divided the land into several pockets. It also connected with the old outer wall. The central area of the island is where the prison guards live. The buildings here are more barracks than houses, as no guard keeps their family here. A building serves for food storage and there are stables for a few grassing animals. Darkwind Prison makes use of its land to farm vegetables, the prisoners must work the land if they are to eat. The farmlands in the island are by no means enough to sustain the population of guards and prisoners. Fortunately, the capital is only a few hours away. A supply ship comes every week, it brings food, water, and other useful things. It also brings a new prisoner from time to time. The biggest building in the island center is the Commander’s Manor. Commander Lucius Darkwind lives here permanently, unlike his soldiers which have seasons off in the capital. Commander Darkwind’s father was the original commander when the prison was established, it was named after him when he made a vow of service to be there for the rest of his days. Commander Lucius Darkwind grew up on the island and knows every pocket of it. He pretends to live here like his father did. That is why he is the only man allowed to keep a wife on the island. His wife and two sons live with him in the manor. Darkwind Prison has endured many break out attempts since its inception. None have been successful. The fact that it is in the ocean rules out many attack vectors on the prison. The outer wall is located on top of a natural cliff face on the island. The cliff is 40 ft. feet tall, and the wall is 30 ft. tall. The only point of access is a small beach on the south side of the island, where there is a small pier. After reaching the beach, any would-be assailant would have to breach the main gates. A big ram would bring those doors down in less than an hour, but getting a ram to that beach is a challenge no one has solved yet. Additionally, many of the outer wall watchtowers are fitted with scorpion ballistas. Two of them are capable of shooting at the small beach and the main doors. On the other hand, breaking out from the inside is just as difficult. A prisoner would have to climb the 6-feet tall inner wall, and then the 9-feet outer wall, both of which have regular patrols. And then jump 70 ft. into the raging open ocean. Many have died trying to escape, but none have made it out alive yet. Surrounding the guard’s area in the center of the island, there are many pockets of land separated by the inner walls. The closest to the center are small. They hold a single prison home. These secluded arrangements are reserved to the most dangerous of prisoners. The prison areas beyond are far larger. They feature farmlands and scores of small prison homes. In essence, they are like small communities. Each prisoner has their own home, the homes are simple but they have everything they need. Prisoners are allowed to move between the different prison areas freely, but they can’t access the secluded homes or the guard’s area. Life here is simple, each prisoner must work the land if they want to eat. Work is optional and the guards do not enforce it or overwork them. As long as they are seen working honestly, they get food. Interestingly enough, most prisoners start to work honestly and hard after a period of adjustment. A life of honest work also has the added benefit of turning arrogant, rich men into better people. From time to time, a prisoner’s sentence ends and they are allowed to return to the capital. Other prisoners congratulate the fortunate fellow with mixed feelings of sadness and happiness. Good conduct and honest work are also a path to reduced sentences. In the 50 years of Darkwind Prison’s history, it has been a successful attempt to solve the problem of nobility and crime. Many nobles came back very different people. The worst of them never came back but they also posed no trouble after their sentence. Darkwind Prison still remains a hard egg to crack, however. There are many very powerful people inside. Power groups from outside and foreign nations never stop plotting on possible ways to break a prisoner out. These are the general features of Darkwind Prison Island. The island is in the open sea, several miles from the capital city. The city is not visible from the island, however. Terrain. The island was originally a rocky formation with a flat top. The cliff face is 40 ft. in its highest point. Inside the prison, the land is developed. There are grasslands and farms. Light. Most areas in Darkwind Prison are open. Lighting conditions respond to the time of day and weather. The walls give ample shadows. Smells and Sounds. The smell of greenery and farmlands is combined with the salty ocean air.